Alyogyne huegelii is a flowering plant in the Malvaceae family, found in the Southwest botanical province of Western Australia, extending along its entire coastline. A large flowered shrub, the species favours the sands of coastal shrublands and heath. 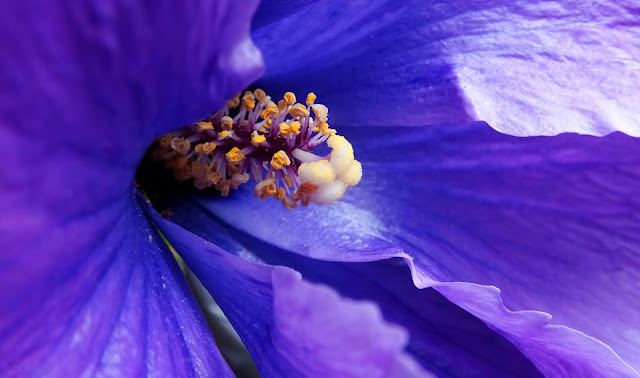 The large flower, highly variable in colour, is similar to that of Hibiscus. It was previously placed in that genus, and is commonly named "Lilac Hibiscus". It is widely cultivated as a flowering plant for the garden, but the varieties and cultivars previously published are no longer formally recognised. Alyogyne is a shrub to four metres with many alternate branches, although lower ones may be sparse. Bright green leaves are divided in three to five in outline; margins are irregular, lobate to toothed; pubescent and strongly veined lobes are coarse in shape. The flowerstalk at the leaf axil is long, tilting at the single flower. The flowers have five luminous petals up to 70 mm long, these are overlapping and have slight ridges. The colour is cream or mauve, or the lilac of the name by which it is traded. The staminal tube structure contains numerous whorled anthers, these are yellow. The five styles of this are fused until the tip, which is composed of swollen and apparently divided stigma. This is supported on a five-lobed calyx, within an arrangement of up to 10 partly fused bracts. As with all the Malvales, the flowers last around a day – becoming deeply coloured and papery when spent. They are numerous in the long flowering period in Australia being between June and January. Oh, I love a detailed photo and you captured this hibiscus beautifully. Thank you for sharing this lovely photo with us! Nice blue with the yellow and white.